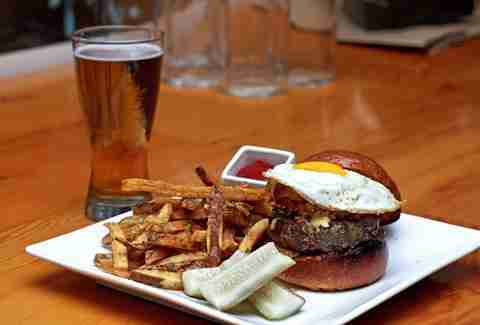 Don’t get us wrong -- we love the burgers at Edzo’s, and Kuma’s, and Leadbelly, and Owen & Engine (seriously, we do) -- it's just that Chicago has approximately infinityzillion burgers. 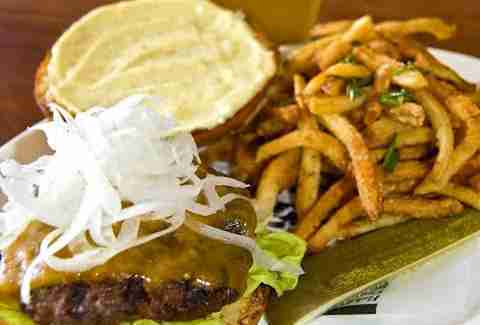 And even though the same 20-ish show up on everyone's "Best Burgers in Chicago" lists, there are plenty of others worth celebrating. 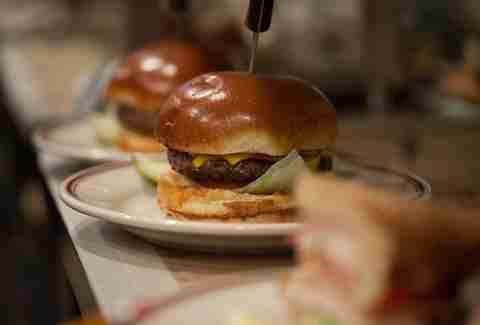 That's why we put together this list of 12 way-way-way-under-the-radar ones you won't find on any of the latest "Best Burger" lists from 1) Chicagoist, 2) Eater Chicago, 3) Chicago Magazine, or 4) Time Out Chicago. 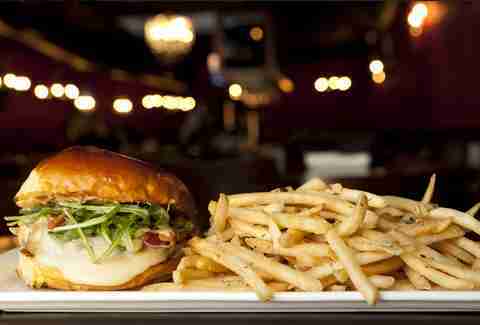 Sure, we COULD say something along the lines of "this bar may be small, but the burger's big on flavor!" but... wait yeah, that's pretty good. 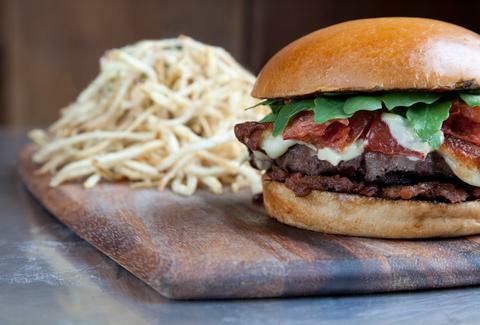 Fresh ground daily, this guy's topped with garlic aioli, bacon, and garlic confit aioli. As is often the case, springing for the extra egg isn't a bad move at all. This bank-turned-dining-hotspot is the kinda place you can sink your grill into a burger candlelight-and-white-tablecloth style. The Slagel Farm beef patty is stacked with onion marmalade, cheddar, bacon, and garlic aioli, and always pay the extra $3 to have poutine added to your side of fries. Au Cheval took top honor in our latest burger rankings, but did you know you can pick up essentially the same burger during lunch at its sister deli Dillman's?? This beastly beef patty topped with red onion, dill pickles, and sharp American offers insane flavor, plus catches you a break on wait times. And they take reservations. 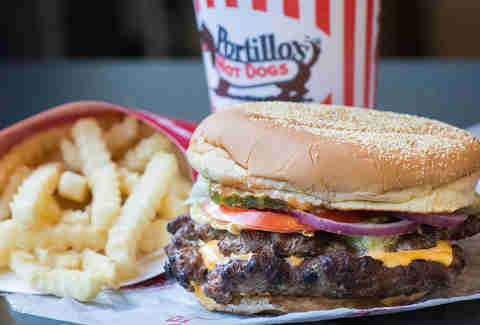 How does something from a chain as ubiquitous as Portillo's fly under the radar? Well, when you're sharing the radar with flawless Chi dogs, Italian beefs, and the heart-stopping genius of the Cake Shake, it happens. Like their dogs, the burgers come with a solid salad of fresh veggies, except here they're atop char-grilled patties piled into a toasted Kaiser roll, all in perfect balance. 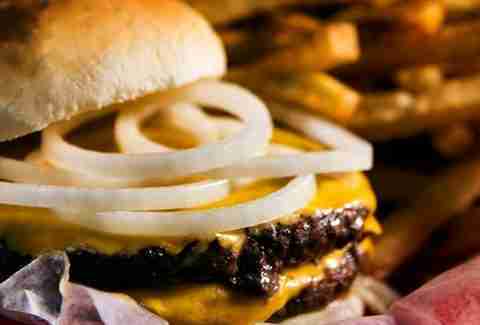 The South Shore's finest burger joint does an almost definitive carry-out double cheeseburger -- a flavor marriage of high-quality beef, melted cheddar, and grilled onions. Despite the name, the Fatso actually isn't THAT big, it's more like the platonic ideal of a fast food burger -- two thin, flavorful, char-grilled patties, fresh toppings, and a healthy dose of "Fatso sauce". Pro tip: don't miss the fries. Class it up with this 100% Wagyu beef patty on a brioche bun, topped with lettuce, tomato, onion, special sauce, and a pickle. Bacon, cheese, sautéed mushrooms, and a fried egg will all cost you $Who,Car.es. 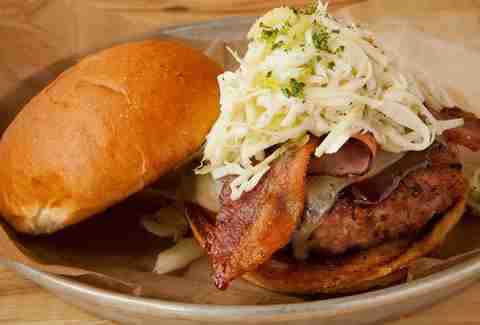 There’s no shortage of burger options at this West Coast transplant, which boasts four house specialties and an expansive “Craft Your Own” ingredient list. Overwhelmed? Get the Number Two with burrata (?! ), pesto, crispy prosciutto, and roasted tomato. 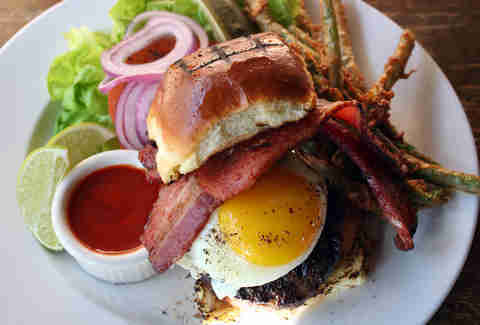 This Wicker Park neighborhood café may not've invented the Ju(i)cy Lucy, but their interpretation of the iconic Minnesota burger is spot-on: Slagel Farm pork patty stuffed with melted smoked mozzarella, topped with a runny fried egg, and finished with garlic aioli and a pretzel roll that holds up to the all the ooey-gooey juiciness. 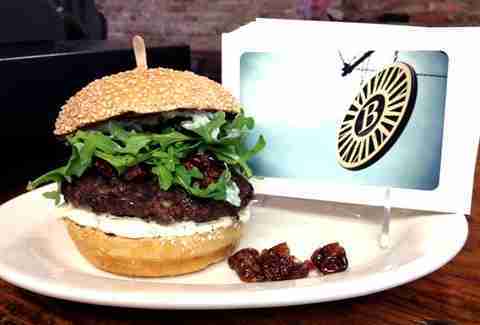 Um, duh, there's a great burger in... Little Italy? 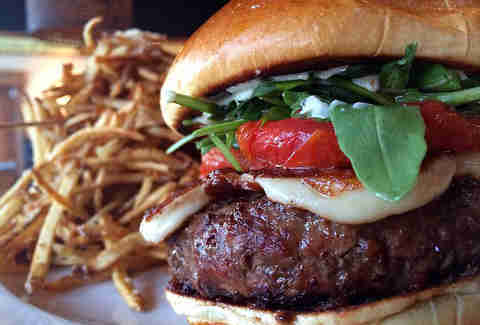 True story, and it's all thanks to bacon jam, roasted tomatoes, arugula, cheese curds, and roasted garlic mayo. 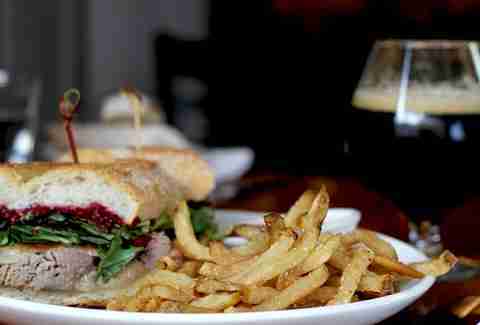 Yes, the classic beef with tomato, lettuce, pickled vegetables, red onion, and cheddar cheese is incredible, but the pork with seasonal jam, house-cured bacon, arugula, and Chihuahua cheese? It's incredible... er. 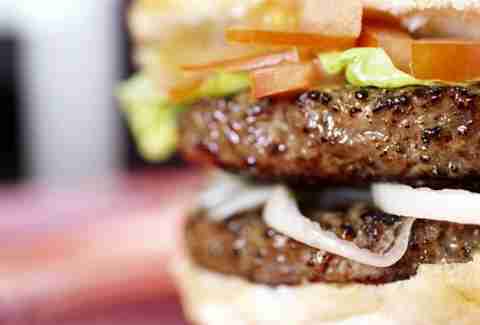 Burger Bar’s, um, Burger Bar walks you through an easy three-step process to creating a big (1/2-pound), beautiful burger with anything and everything you could ever want on it. Literally, you can't screw this up. Also: a side of fried pickles is non-negotiable, as is a Malted Milk Ball Madness Milkshake. Sean Cooley is Thrillist's Chicago Editor, and wishes Pizza Hut would keep giving him free pizza for reading as an adult. Follow him @SeanCooley.